Floor coverings can be clean from top to bottom—will be, if you clean them with a Hoover. It removes more dirt per minute than any other cleaner—gives faster, deeper cleaning, with less expenditure of human energy — because it gets out dirt that other cleaning methods never reach! Deep in your rug is embedded grease-caked grit which suction alone simply cannot remove. It takes the deep-beating action of Positive Agitation to shake loose this packed-in dirt and dance it to the surface to be suctioned away. Only when it is removed, can you call your rugs wholly clean. Not only does The Hoover get rugs cleaner but it makes them lovelier, removing the unsightly thread and lint, lifting and straightening the nap, brightening the rug colors, giving them thoroughly scientific care. Ask your Hoover dealer for a free trial or home demonstration of The Hoover and its efficient dusting tools. 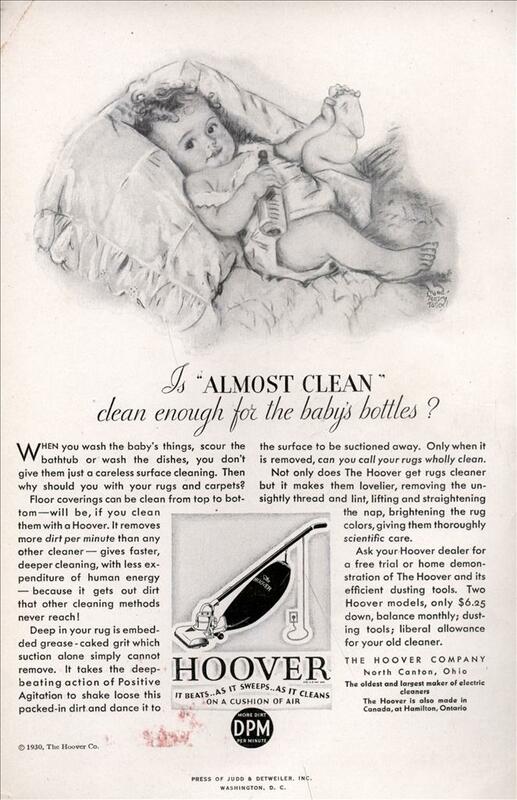 Two Hoover models, only $6.25 down, balance monthly; dusting tools; liberal allowance for your old cleaner. PRESS OF JUDD & DETWEILER. INC.
First child: The baby drops his pacifier on the rug and you freak out, boiling it briefly before putting it back in the baby’s mouth. Second child: You shrug, pick it up, give it a quick dust-off and stick it back in the baby’s mouth. If vacuuming is giving your carpets “scientific care”, I’m the least scientific person I know.